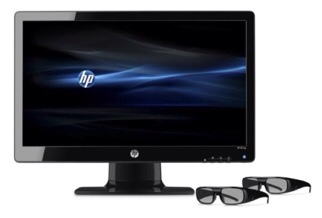 HP announced a 3D PC display and a 3D PC today. To me, at least, the most interesting thing about them is that the company chose a different flavor of 3D for each device. First the display. Its official moniker is the HP 2311gt 3D monitor, and it’s a 23″ LED-backlit display. Like most 3D movies you see in theaters, the 3D is passive, which means that its uses polarized glasses that don’t have any embedded electronics and don’t cost a lot of money. In fact, the display and two set of glasses go for $299.99, or about what you might pay for two pair of active-shutter glasses alone. Quite true the coexistence of the three possibilities would be interesting to see. But on a side note I am very much exhilarated with the present leap of technology…enjoying this flight !! Passive means your halving your resolution (and brightness), active your frame rate. Most active displays are 120hz to compensate, but the 2311gt panel is only 1080p so you’re loosing 1/2 your res in 3d mode. I agree with Harry that passive is preferable to active, but the tech needs to be significantly further refined before I would actually use it regularly when gaming/watching movies. Stereoscopic 3d + head tracking in a game could make it more interesting, as you could actually get a different view on the world when you moved your head. It would limit the display to 1 user though.